Roadway Construction Service is proud to announce our selection to be part of the Los Angeles County Metropolitan Transportation Authority (Metro) Crenshaw/LAX Transit Project. Our initial scope of work includes assisting the Walsh-Shea team with the route preliminary site investigation by providing a safe work zone for the subterranean mapping investigation by Parikh Consultants. Roadway Construction Service looks forward to continuing to be part of the team throughout the entire approximate $1.3 billion contract awarded to Walsh/Shea Corridor Constructors. 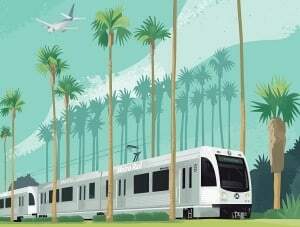 The complete project includes their design-build on the Crenshaw/LAX Transit Corridor Project, an 8.5-mile light-rail line that will run between the Expo Line on Exposition Boulevard and the Metro Green Line. The Crenshaw/LAX project is one of a dozen transit projects funded by Measure R, the Los Angeles County half-cent sales tax. The Crenshaw/LAX Transit Corridor Project will consist of eight stations serving Inglewood, Westchester and the LAX area.